Now into the egg mixture add milk, alternately, little by little, with flour mixture. Stir well after each addition. You’re looking for a firm but not too stiff dough. Cover with plastic wrap and store in the fridge. When you’re ready to make donuts, get your tools in order: a cast iron pan (or an electric fry pan, as Jess’ mother used), 1.5 litres of vegetable oil (or 2 1/2 lbs of lard if you’re old school), more powered ginger, a rolling pin, a little extra flour for rolling, a knife to cut the dough, a cookie sheet lined in newspaper then paper towel, a bowl of sugar, a cooling rack and a long fork-like tool for scooping donuts out of the oil. And of course a donut cutter. Heat oil -or lard- in the pan over high heat. Add a teaspoon of powered ginger to the oil. This will keep the oil from seeping into the donuts. Meanwhile, cut dough in half, put half back in the bowl, and knead the other half on a lightly floured counter top. Roll dough to 1/4 inch thick. Get down low to make sure it’s level. Cut dough with donut cutter. 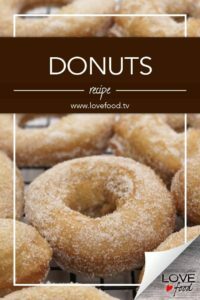 If you don’t have a donut cutter, use a cookie cutter or mason jar and a small cap, perhaps one from a screw top wine bottle. Keep going until you’ve used all the dough. Drain donuts on the paper towel, then turn donuts, one by one, in bowl of sugar to coat. Place sugared donuts on cooling rack. Continue, quickly, until donuts are all cooked.